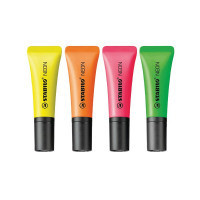 These innovatively designed STABILO NEON highlighters feature a unique soft tube design for comfortable use. The bright neon ink has the same anti-dry out ink formula as other STABILO highlighters and the colours won't fade on the page. The chisel tip produces a 2.0 - 5.0mm line for neat underlining and bold highlighting. This pack contains yellow, orange, green and pink.